Mr Michael Ridley led the Café Service this month; his theme was “Influence”. He posed the questions; who do we influence, and who has influenced us. We were given time over lunch to ponder on our answers. 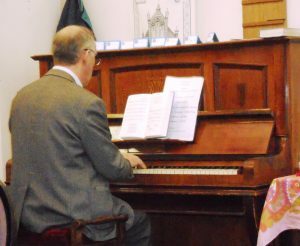 We sang hymn 613 from Rejoice and Sing, Lord, speak to me that I might speak, with the talented Mike playing the piano. In preparing for the Café Service, Mike had been wondering which Bible reading to use that would best capture the essence of influence; he decided upon St Luke’s account of Jesus from being a toddler until he went back to Jerusalem with his parents when a twelve year old. Mike’s reasoning for this choice was that children are susceptible to influence; all of us present had been children, had been influenced by parents, teachers and by Jesus himself. The story told of Jesus growing older, and wiser, even at the age of twelve; he knew we had also grown older, but wondered if we had grown wiser. From personal experience, Mike told us of who had influenced him. Many faces had flashed across his memory – parents, teachers, neighbours, friends; but one person in particular came to mind. This person was a minister Mike knew as a teenager; he could not remember his sermons but he had a strong recollection of looking at the minister and seeing Jesus emanating from him. 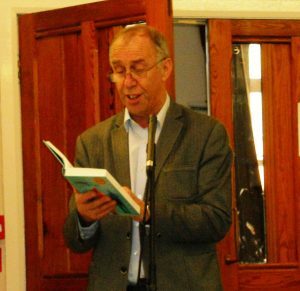 He also recalled his grandfather who was a local preacher who went by bicycle from church to church in the Cumbrian hills. His grandfather had told him that Jesus had said that it was going to be hard to be one of his disciples; Mike wondered if we thought this was true today. Now a grandfather himself, Mike had recently attended his grandson’s school harvest service; the theme was gifts of the spirit. He got quite emotional during the service and found himself asking who had influenced his grandson; this made him realise the responsibility associated with influence. Showing another aspect of influence, Mike read a poem written by a Syrian lady. The poem asked the person to whom it was addressed, who took the place of those you had loved? Who twisted long held truths into long drops of poison? How could you hate so much? It transpired that the lady was a Syrian mother; the poem was written to her son who, from being a loved and loving son, had become a suicide bomber. After lunch, Mike asked for our examples. He cited two he had heard from people at the table at which he was sitting. One related to little kiddies, two sisters who at the same time could be both supportive of one another and indulge in mischievous behaviour towards the other. The second concerned the negative influence shown by holiday companies who rocketed prices during school holidays, which encouraged some parents to take their children away during term time. Philip Kennerley spoke of a lay preacher, Bert Hamilton, who, (other than Philip’s own father), was the most brilliant preacher he had heard, and a great influence on him. Mike closed by saying that in his role as Chairman of St Luke’s he had witnessed nurses and doctors looking after patients who only had a few days left to live. Their dedication and commitment was a great example, and prompted his question, what is our legacy? We finished by singing ‘Lead us, Heavenly Father, Lead us’ which Mike said summed up everything he might wish to say.